Lightweightand flexible durable soles provide hours and hours of comfort for your kids durablewear-resisting. Anti-collision shoes to protect toes. Many Color for your child's love. Suitable forcasual walking, outdoor playing, running and other exercises, best gifts for your children. Measuring foot length is highly recommended and checking SIZE CHART belowis necessary before ordering. If your child has a pair of wide feet or a high instep, please choose a big one yard. PU Synthetic Leather is waterproof, the upper material is durable breathable and easy to clean. TPR anti-slip sole ensures safety for kids. The rubber sole is soft, comfortable, flexible and has good cushioning properties. It is suitable for children who are growing up. Elastic straps and hook & loop closure tape are comfortable, practical and fun. The back heel double fixed design can prevent the child from spraining the ligament of the foot during walking, running and jumping, and reduce the damage to the arch. Your child need to have a pair of comfortable kids sneaker in any activity! 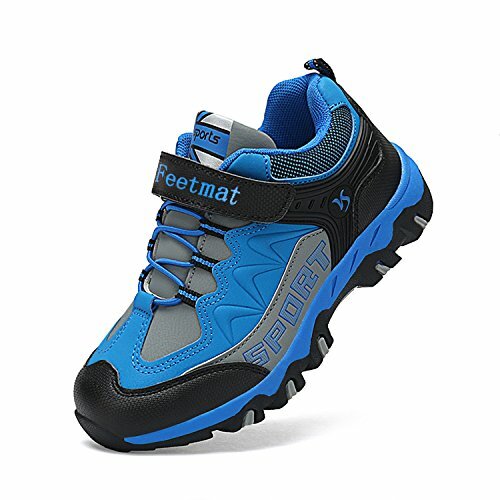 These shoes are suitable for school, gym class, running, playing, hiking and so on. If you have any questions, please feel free to contact us and we will get back to you within 24 hours.